When a family is looking to add interest and fun to their child's Los Angeles bar or bat mitzvah event, the addition of performance artists and costumed dancers can be the perfect solutions. 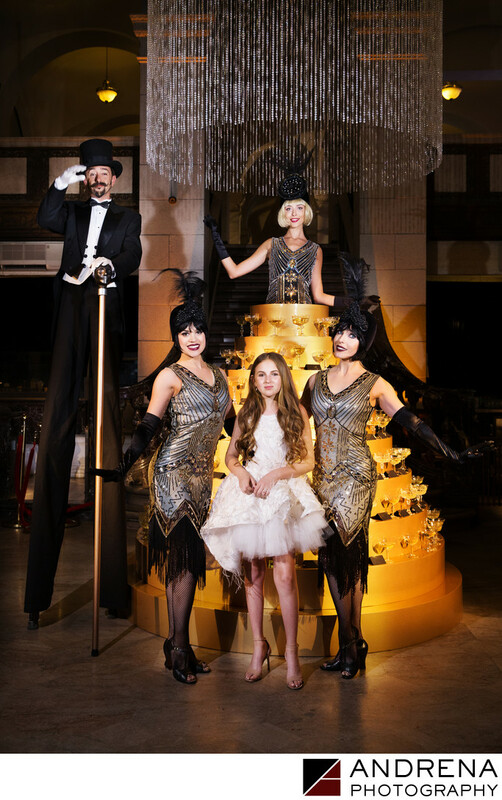 For this Great Gatsby-themed bat mitzvah, Aliana Events secured a tuxedoed stilts walker, flappers who later morphed into feather-swan dancers, and a champagne girl whose skirt featured shelving that held glasses of champagne and guest table placecards. The performers made for a wonderful entrance experience for the mitzvah guests, and added theme and whimsy to the rest of the party. These performers changed costumed numerous times, both to dance and to serve desserts. Zen Arts is a great place to hire performance artists for Los Angeles parties and events of all kinds.